Well, I’ve been woefully neglecting my sad little blog here. Life sometimes gets in the way of the fun stuff but I have been knitting a bit. 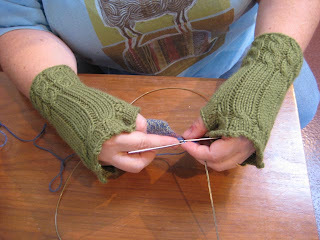 Although it was gift knitting so I couldn’t blog about it right away but now I have some stuff to show. 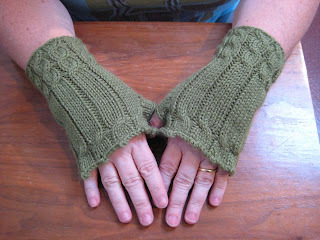 Here’s one new FO – Fetching Mitts for my dear friend Janel. 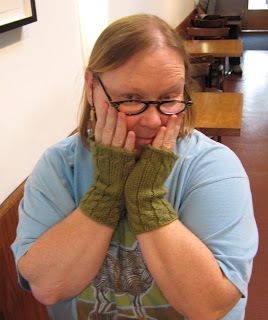 These mitts are such perfect gifts. They are quick and easy and everyone loves them! Some of you may notice that Janel is wearing a Maryland Sheep & Wool Festival T-shirt – yeah, she’s a fellow fiber geek! It’s always fun to knit for those who really appreciate it.